The Campus Recreation and Wellness Centre (CRWC) bustles with both Durham College (DC) and University of Ontario Institute of Technology (UOIT) student athletes. Sydney Green may be one of them next year. She clutches her winter coat and stands next to her parents, who have driven more than three hours from Kemptville to Oshawa. The family are waiting for the DC women’s soccer coach to give them a tour of the facilities and the school. 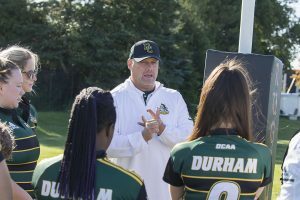 Each year during their sport’s season, coaches at both DC and UOIT work hard to lead practices, play games, and maybe get to the playoffs. But they are always looking at the next season. Coaches double as recruiters for their respective teams, searching for more than the best athletes. When they find the right fit, they send program books and athletic information. Coaches also try to get students on campus, so they can see where they will study and where they will play. “All the support they give their athletes helps with the nerves,” Green says of the tour she went on at DC. These supports come in many forms, such as study halls and athletic therapists. Alex Bianchi, DC women’s head soccer coach, guided the tour. “I want players to come to Durham because they want to come to Durham,” Bianchi says. As he walks Green through the CRWC building, he mentions the perks of being a student athlete, such as sports therapy services. As the tour continues in the Gordon Willey Building, he changes his focus to academics. Bianchi says he needs to “sell parents on the academics” at DC, and why it is a good choice for both soccer and schooling. He says although he is concerned with grades, he never wants to discuss them with athletes. He believes they have enough resources. “There’s no excuse to fail,” says Bianchi, who has spent two seasons with the team. This is a sentiment echoed by many coaches at DC and UOIT. 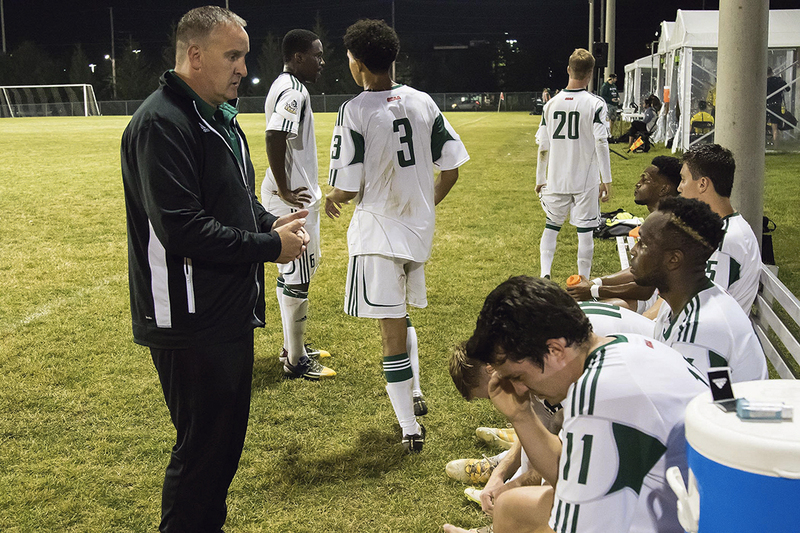 Dave Ashfield, Lords men’s soccer coach, says players are students first and need to succeed. “I care about them as a person, as a student and last of all as an athlete,” he says. 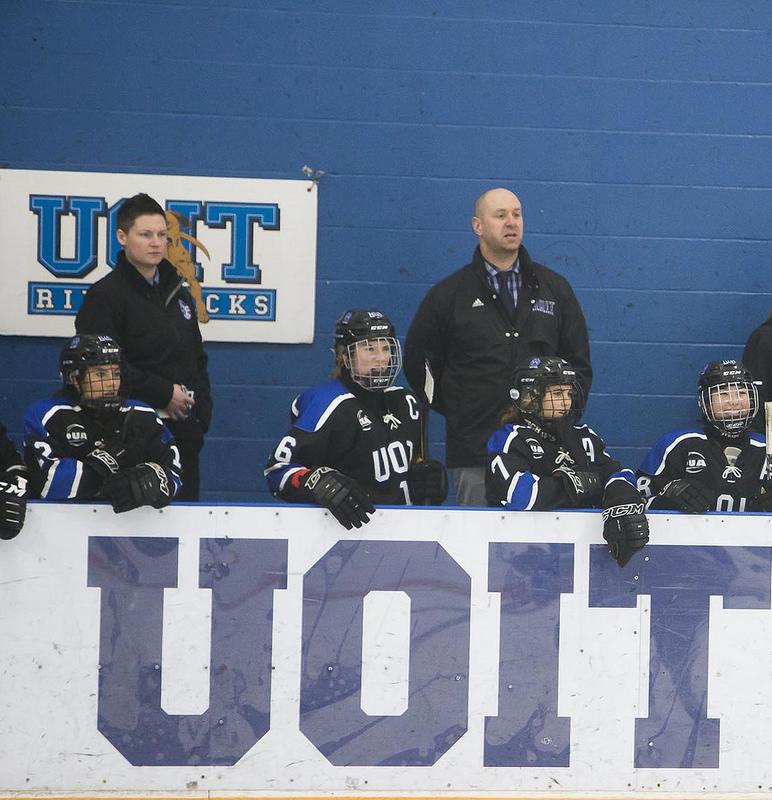 Justin Caruana, Ridgebacks women’s hockey coach, says he won’t shy away from players just because their grades aren’t as high as someone else’s. “We try to tell them that it’s not a right, it’s a privilege that you get to play hockey while you’re going to school,” Caruana says. He says he believes people develop differently, sometimes later in life. Curtis Hodgins, Ridgeback men’s hockey coach, has the benefit of getting players later in life. Since players can play for the OJHL until they are 20 years old, many players come to university hockey at 21. 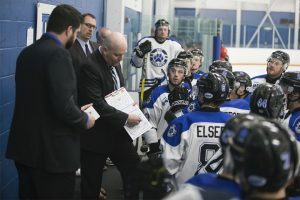 “When I first came in, I was solely looking for good hockey players,” Hodgins says, but now he also looks for good students, adding the dynamic of the team has changed. 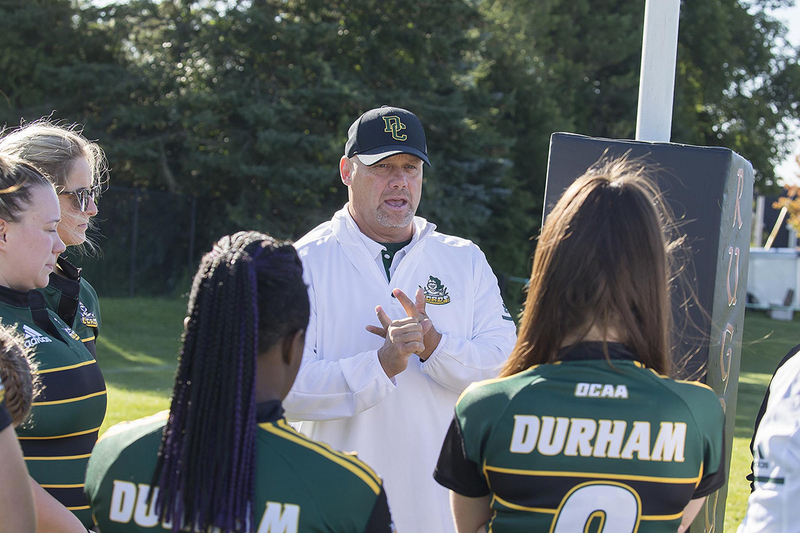 Two coaches have wrapped up their first seasons this year, at DC in men’s and women’s rugby. Coach Christopher McKee had a tough first season with Lords women’s rugby, having won one game of their 12 games. He says he is looking for leaders, players who are willing to work hard and learn. He’s not focused on grades. Yet. “(My) approach has changed, to be a little bit more open-minded to not just good (rugby) programs but looking for good players in general,” McKee says. John Watkins, Lords men’s rugby coach, wants to see his players be good people outside of the game. “That’s what we look for… not only willing to work really hard but also to get involved with initiatives outside of practices and games,” he says. While coaches see academics on different levels, they all know one thing is the most important: the team. Caruana, who has been with the women’s varsity hockey team at UOIT for five seasons, says he will target girls for positions he knows other girls play who are close to graduating.But he also wants players who want to be at UOIT, who will take pride in the university. Caruana says he wants the “best product on the ice” but isn’t always watching what they do with the puck. “Sometimes I’ll watch (player’s) body language, I’ll watch how they are when they come off on the bench,” he says, adding he will look at how supportive they are of their teammates. Similarly, Hodgins says he looks for players who aren’t selfish. “In some cases, I’ll know right away it’s not a fit,” he says, either for the player or for him and his team. Hodgins, who has been with the men’s varsity hockey team at UOIT for three seasons, adds the team has a family feel. While hockey has been at UOIT since the school opened, rugby at DC faced different challenges thanks to its inaugural season in 2018. McKee says coming into the season, which was his first, he only looked at high-end programs, but for next year’s team he’s looking more at local high school players. He isn’t ignoring the team’s need for elite players, though. “In sevens rugby, two or three elite players can change you from being a second last place team,” McKee says, adding those players could bring a team to the top three in the league. Watkins had more luck with his rugby team in the 2018 season, despite recruiting six players before the season officially started. The rest of the team was comprised from open tryouts. The men’s rugby team is a team players want to be a part of, he says. “Players know, coming to our school, we take our program seriously,” Watkins says, acknowledging the successful season the team had. Another successful team is DC women’s soccer, who won bronze last year in the playoffs. The success of the team helps bring in players, Bianchi says. They won bronze last year during the championships. He scouts players from clubs, like FC Durham Academy, and says a club says a lot about a player: if they are a player who cares. The motto for the DC women’s soccer team? “Soccer comes first, school comes second, and nothing else matters,” says Bianchi. It could be said the same motto applies to the men’s soccer team. Ashfield, who has been with the Lords men’s soccer team for five seasons, says he had to cut his star player a few years ago. He says the player was disrespectful to the staff and his teammates. “The first year of schooling he got nothing, like not a mark, never went to class, expected other people to do his schoolwork,” Ashfield says. He says he had to evolve the player, and explain that is not acceptable. Ashfield says as a coach his recruiting style has developed over time. “(I can) see a vision where an athlete fits into the team,” he says. Ashfield is also concerned with a student as a person more than an athlete. “Really the goals and dreams of the athlete, I think, is the biggest thing,” he says. As for DC women’s soccer, Bianchi says his recruiting style has not changed. He says he is looking for the right players to make the team better than it was yesterday. 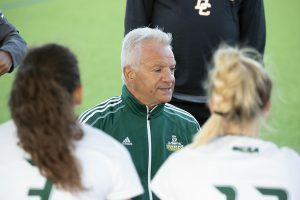 Within one year of coaching, Bianchi had the team on-track, doing well on the field and in academics. He adds it could have taken three years to get there with the team. Also trying to get there, the men’s hockey coach, Hodgins, says “wears many hats” in addition to head coach, such as general manager and head scout. Hodgins wants to put his stamp on the program, something he says will be a seven-year process. Caruana has had more time to shape the women’s hockey team. In his office, he has a colour-coded binder full of all possible recruits. He has notes on each of those players, and whether they have committed to other schools. He says he already has his team set for 2019 and is almost done recruiting for 2020 as well. Speaking of creating a history, both McKee and Watkins have begun to start a new chapter in DC rugby. In their favour, they both participate in rugby outside the college. 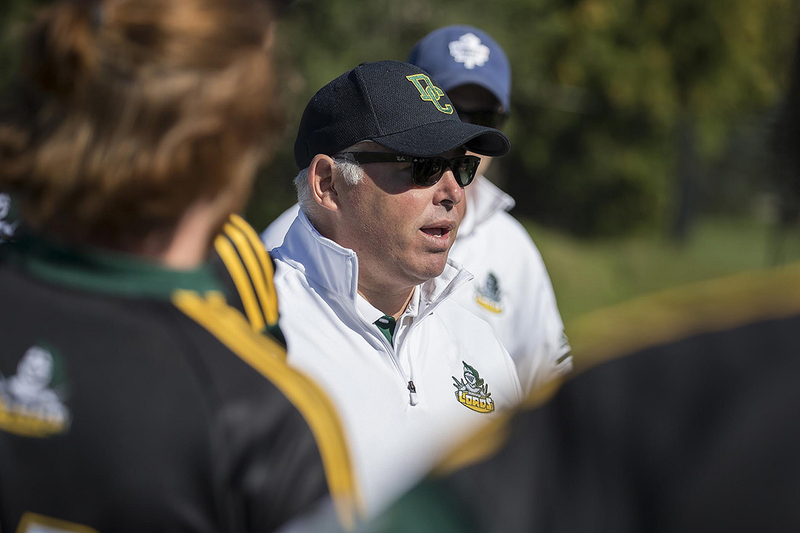 Watkins is the president of the Oshawa Vikings rugby club and has coached with them since 2007. McKee is a high school teacher at Uxbridge Secondary School and coaches the girl’s rugby teams and with the Oshawa Vikings as well. 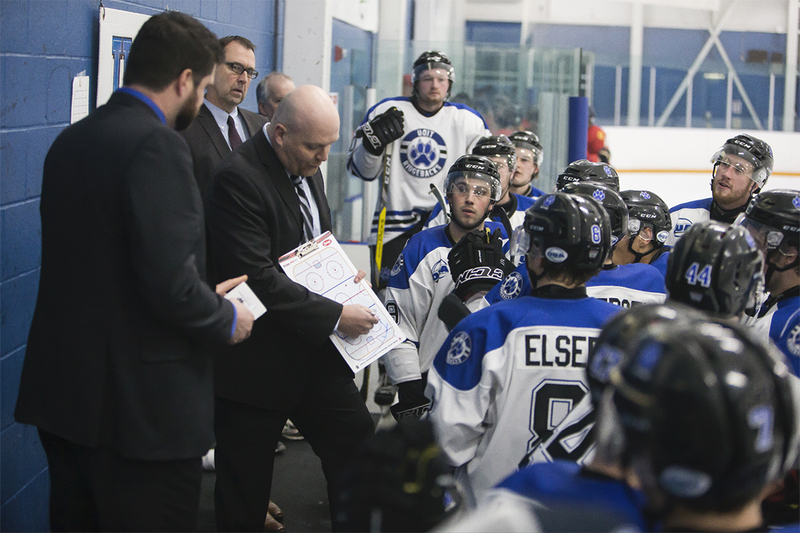 Building a winning team isn’t easy, but coaches at DC and UOIT know that. Their experience helps with their unrelenting search for the right players. But they are keen to remember a student athlete is a student first. As for prospective student and sports recruit Sydney Green, she hasn’t decided on a college just yet. However, current student and rugby recruit, Daniel Cooper, was one of the six players recruited for the inaugural rugby season. 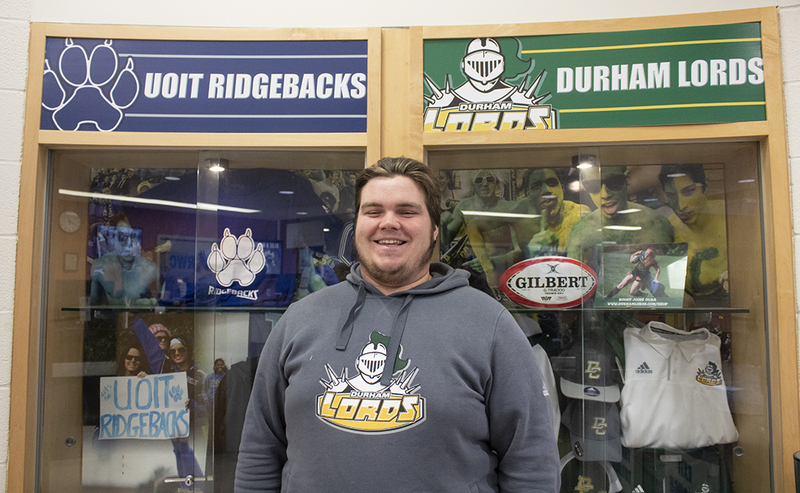 Cooper is no stranger to Coach Watkins, he has known him for more than five years through the Oshawa Vikings rugby club. “He sees everybody for who they are, not just a team,” Cooper says, adding he thinks Watkins is a great coach.